Did you know Minneapolis offers free sand for sidewalks? All you need to do is stop by one if their sites and bring your own shovel and pail. 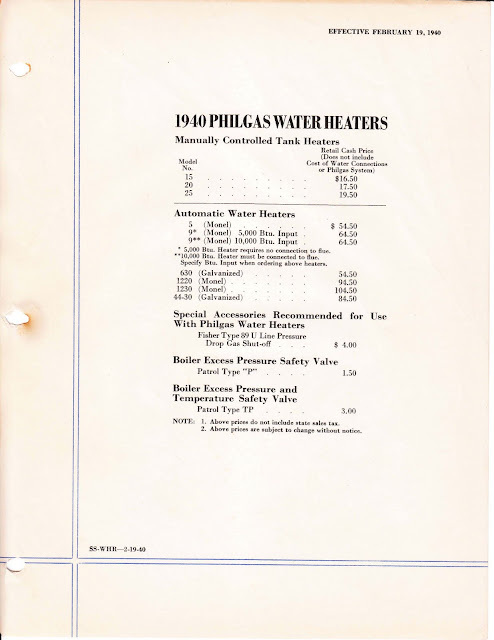 I've been scanning some old Philgas stove sales brochures and ran across these sales brochures for 1940 water heaters. 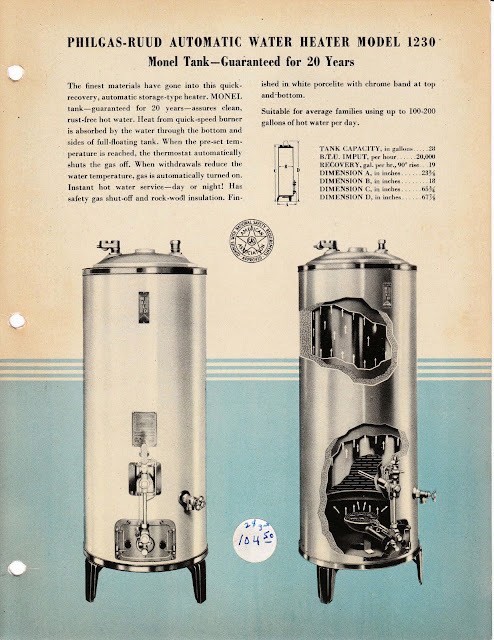 Considering my recent water heater experience, they caught my eye. 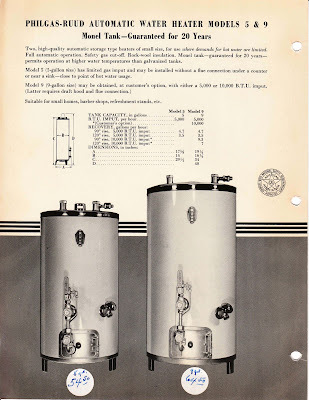 We once had the capability of building a 20 yr water heater. Now they typically last less than 10 yrs, if you are lucky. Something is wrong here. Oh, and check out those prices. I almost cried. Santa brought me an electric fry pan. I've wanted one for years. I unwrapped the pan and was looking through the instruction manual and joked "Geez, now I don't really have to finish the Tappan." Just for a second, I think my horrified mother thought she had inadvertently contributed yet another delay in getting the Tappan Deluxe stove up and running. Everyone is anxious to see the stove out of my living room and into my kitchen. Another small step in the name of weatherproofing. A few days ago, my dad came over and helped me put insulation into the spot where my basement rim joists meet the first level floor. 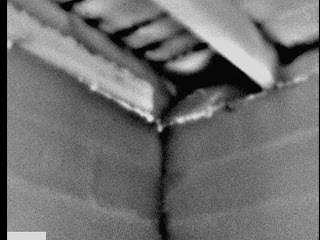 When I had my infrared energy audit done, this was one area the energy auditor pointed this out as an area that could use some work. 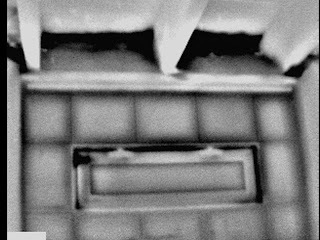 The dark areas in the infrared photos is where heat loss is taking place. There was old insulation in some of the joist bays on one side of the house when I moved in. But as I've had electrical work done....and when they installed the glass block windows....even this insulation had been pulled out and tossed. The joist bays have a funky shape as the concrete basement walls were topped with a slanting pile of concrete. I had been dreading doing this and kept putting it off. But, once we got started it was really pretty easy and only took a couple of hours. I will say the scoring detail in the plaster beneath the paint makes the effort worthwhile. It's going to look nice with one coat of fresh paint on it. I'll be happy never to see the color peach again in my life. The Federal Trade Commission, obviously having some time on their hands, has decided that the world just may fall apart if they are not able to regulate the review of products by bloggers. In their infinite wisdom they have declared that a blogger must disclose if they are paid or receive free products for their reviews. Or else. As nice as it would be to have packages of free stuff and product review payment checks arriving at the doorstep of StuccoHouse..none of my product reviews (and they are far and few between) are based on free products or payment. I don't read blogs where they constantly are promoting some vendor giveaway with a gushy product review...nor where I know a product review is written to keep that gravy train of free stuff coming. So, I wouldn't subject my readers to that. If you read a product review on my blog, it's because I have purchased the product, used the product and genuinely liked (or disliked) the product. You get the good, the bad and the ugly. If I ever actually received a free product (don't hold your breath), you would be the very first to know. End of story. This post will probably be of interest to few people other than me (and possibly my dad). We've been hit by a cold spell here and I've been trying to think of ways to further weatherproof my house. I've done a lot already. But, my dad suggested that maybe putting the door to my basement back up might be a good idea. The PO removed a bunch of doors to "open up the flow" of the house. I gagged a little typing that. Thankfully, they were stored in the basement. I wrote a few months ago about hauling up the door for my kitchen and getting that back in place. I've also written about this silly hallway I have whose walls are filled with doors. Well, now there is one more. Each short wall, two doors (the oak door leads to the "formal" space of the dining room). 8 doors total. I like it. It's quirky. It defies "flow." Having the old door back in place has raised the temperature a couple of degrees. And, yes, that's *still* the bathroom sink laying there. For the past week or so I've been in the throes of a water heater situation. I'm not going to write about it because, frankly, it sucked the life out of me. 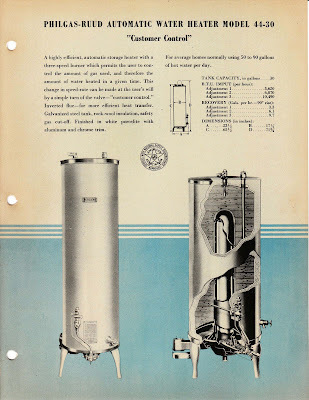 Although, I am curious to hear if anyone has purchased a water heater on ebay or Amazon - as I briefly toyed with that idea, but chickened out. I am left with a general disgust with my house (and my car, but that's a whole other long story) and it's ability to consistently produce a big, fat, expensive fail at precisely the worst moment. I mean come on...right before Christmas?! I'm sure this will pass. It always does. But for right now, I can't talk about the house. A few of you have already discovered the link I added to the side bar. 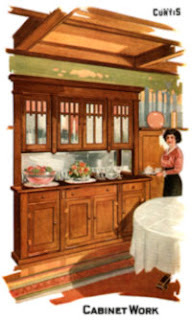 I've created a page on my blog specifically dedicated to vintage Tappan stoves. Not a week goes by that I don't receive at least one email from a Tappan owner looking for information, advice, or just someone to share their Tappan enthusiasm. My record in responding to emails is admittedly spotty. I just don't have the time to reply with info. to each email, and often I don't know the answer to the question asked. Please keep in mind that the Tappan Talk page is very much in it's preliminary stages. I hope to put up posts by category so they are easily searchable and comments are limited to one topic. Just a very quick post. I'm dealing with both a busy work life and an ocean of leaves in my yard. But, I promised last year to let you know when the Epworth United Methodist Church was taking orders for pasties. Consider this your notice. Orders for pasties must be paced by Thursday, Nov. 5th. (ordering done for this sale - next sale is Feb 6, 2010 cost will be $5.00). The cost is $4.50 - specify either meat or vegetarian. Orders are then picked up at the church on November 7th - 3207 37th Ave. S., Minneapolis. Another intriguing dinner will be held at the Minnehaha Communion Lutheran Church. Their lutefisk dinner will also be taking place on November 7th - 4101 37th Ave S., Minneapolis. Reservations are required for this one. Call the church at 612-722-9527. Seven years ago today I moved into StuccoHouse. Some days it seems like it was yesterday, others like it was 15 years ago. How did I celebrate the anniversary? By hanging some glow-in-the-dark fake spiderwebs on my front door overhang. Yes, I splurged the extra dollar for the glow-in-the-dark version. I hope the added expense was worth it. Honestly, the spider web looks a whole lot better in real life when the wind isn't blowing. 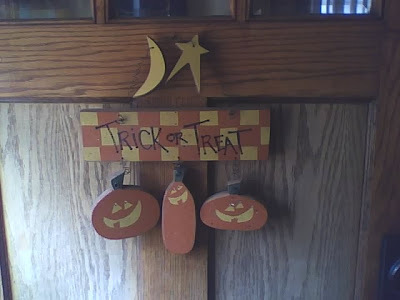 At any rate, Happy Halloween to all! Not much, but the new shelves for my chimney cabinet are now painted red. This is the same red that one day you will see below the chair rail in my kitchen. I have the bulk of the old paint off of the chimney cabinet itself. But, since my last post on the topic things have become cold here and open window ventilation is no longer possible. I have a fear of working with chemical stripper inside with my gravity furnace. That said, I'm sure in a few weeks boredom, stupidity & ambition will drive me to come up with some way to get the remaining paint off of the cabinet. 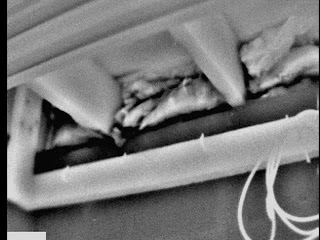 Of course, removing the tiny remains of paint in the crevices usually take the most time. Pulled my screens out and replaced them with storms this afternoon. I probably won't be so fond of this task when I'm 90, but I enjoy it now. I only change out 6 smaller windows, so it's not overwhelming. Shown in the photo is the wood trim I'll be stripping and repainting next summer. Here are the three stages: storm in, screen out, screen in. 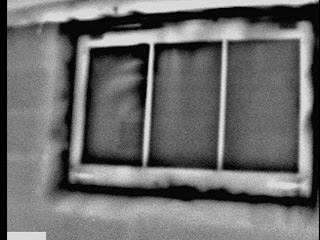 Under the gun yesterday, I was able to get my kitchen window exterior trim primed and painted. As predicted, it snowed last night and today it's cold, cold, cold (30's) and windy. The kitchen windows don't have storms. I took off the awful aluminum triple track storms two summers ago. I have wood screens (salvaged) and the plan was to promptly find wood frame screens. But, I've been waffling between traditional wood storms and Marvin wood frame combination storms (pricey as my windows are non-standard sizes). As I look back at my posts, I see I wrote another full-of-angst-because-winter-is-coming-and-I-don't-have-kitchen-storms post last year at about this same time. Oh well. Last year I survived the winter without kitchen storms. I left in the wood frame screens. This wasn't very good on the double hung sashes. So, this year I got a little more ambitious. Then I put on some of that exterior grade winter sheet plastic on the exterior of the wood frames. I was able to pull it pretty tight, so you can't see it from the street unless you look closely. I waited as long as I could today to let the paint from yesterday dry as much as possible. When the sun started going down, I put in the fake "storms." I like the pale yellow & gray combination. We're set for another winter...well, kitchen window-wise at least. We have had two days of sun with temperatures on the 50's. So, I've had time to prime and paint my exterior kitchen wood trim. I stripped the trim down to bare wood, so the trim details are nice and crisp (not to mention lead free). I've included some close ups of the repaired rot. You can see that I stripped the exterior paint off of the sashes (and sash channel) - I'll be removing this from the inside, reglazing them, repainting them, and putting in a new rope. But, that's a whole other project for another day. It never ceases to surprise me at how yellow that paint it once it's on. It looks like a very light creamy yellow in the can (BM Barley). I'm writing this post as I wait for the first coat to dry. Then it will get a second coat of paint. I also need to run down to the hardware store to buy some exterior plastic to put under the wood framed screens (not in these photos)...as I still don't have wood storms for these windows. The final photo is what the trim originally looked like. Ugh. Snow is in the forcast for tomorrow. It was not supposed to rain today. I had plans to put a coat or two of primer on the exterior trim of my kitchen windows. 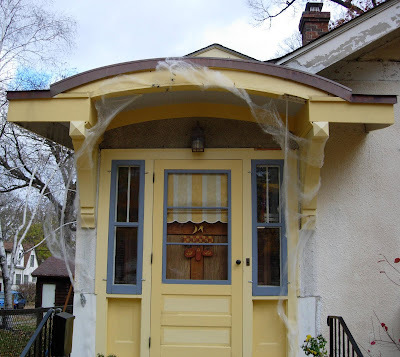 I started stripping & repairing this trim last fall and finished up a few weekends ago. Now I have my fingers crossed that it will stop raining long enough for the wood to dry before we get hit with snow. Stress. As big of a hassle as it was to install, I am totally in love with my new kitchen ceiling light. I finally got the thing installed and working this morning. Because the light electrical box was kind of sunk into the plaster ceiling...and the ceiling tiles exacerbated this....I had originally installed an extender box. 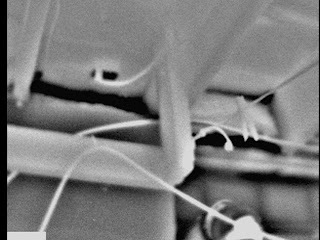 But when the light was installed, this caused it to hang down 1/2 inch from the ceiling. It finally dawned on me that a better approach would be to remove the extender box and use really long screws to attach the light to the existing box. School House Electric was kind enough to send me some longer screws. It worked, the light sits flat against the ceiling with a tight and solid fit. You can see the new cabinet in the background. I still need to paint half of the ceiling tiles - if you look closely you can see some of them to the far right are still white. I was at Home Depot the other day and managed to charm the guy in lumber into cutting shelves for me to the exact size needed for my chimney cabinet. I had been putting this off forever because I though it would involve hauling home a 4'x8' piece of plywood and having to cut it down. I have them sanded and primed. They are going to be painted vintage red. The second advancement in home restoration this week was the arrival of longer nickel screws for my kitchen light fixture. After I contacted them by email, Schoolhouse Electric was kind enough to send out a pair of screws to me. The light can now be installed. Hurrah! Spending some time today stripping a vintage birch chimney cabinet I bought some years ago. You can't tell in the photo, but the glass is original and wavy. I had new shelves cut yesterday. It's the same wood as my kitchen cabinets, so I plan on shellacking it and using it in the kitchen. The shelves will be the same vintage red that is going on the kitchen's lower walls. I actually have the door and hardware already completed, but will share those photos with the rest. I have the rest of my kitchen ceiling installed. I installed the bulk of it a few weeks ago when the new cabinet was going in. The remaining pieces needed to be cut to size & put up....and to get motivated to do that took me a while. But, its up. Now the remaining tiles just need to be painted. I was also able to get the ceiling electrical box ready for the new light. I was all ready last weekend to install the ceiling light I purchased from Schoolhouse Electric. I turned off the main electrical switch, crawled up the ladder with the light.....and realized the screws supplied with the lamp were way too short. Easy peazy, I though. I'll just run to the hardware store and get two longer ones. Four hardware stores later, it dawned on me that these screws were not going to be found locally (slotted, 2", nickel plated). So, I sent off a polite email to Schoolhouse Electric asking them if it was possible they had a couple of replacement screws I could buy....I referred them to my kitchen lighting post. Well, they checked my blog post....and then promptly ignored my email. No response. Not a peep. So, still no light in my kitchen. UPDATE 9/15/09: Today I received a call from Schoolhouse Electric and they are sending me two screws. Yeah! 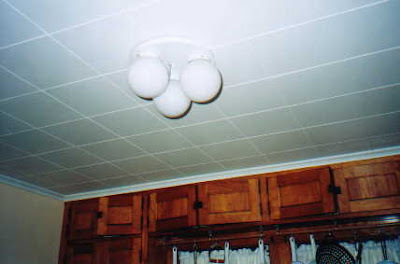 I am very anxious to get that ceiling light up. All's well that ends well. It appears that the Evil Squirrel may have been falsely accused of the cabbage incident. New evidence has come to light that appears to exonorate him, and I am forced to retract my previous post's accusations. Although, in my defense there was a lot of evidence that pointed directly to the squirrel. And his behavior in the past quickly moved him to the top of the list of usual suspects. Moments before I discovered the cabbage head in question, I saw the squirrel suspiciously close the to garden and could have sworn I saw a slight satisfied smirk. Also, every morning I open my front door to see a spilled pot of parsley & the flowers bitten off of my potted mums. Clearly this is a squirrel accustomed to behaving badly and without regard to the rules of common civilized living. But as it turns out, a commenter to my previous post mentioned a little phenomenon called "split cabbage." Karen Anne's comments in my previous post provide a link with a photo of someone else's split cabbage. I have to admit, she appears to be right. I have been watching CSI for enough years to know that you have to follow the evidence. As a result, all charges against the Evil Squirrel for this event have been dropped at this time. I retain the right to resurrect said charges if new evidence surfaces. The little snot. And that it *not* the word I want to use, but this is a G-rated blog. After I spent the entire summer watching over these four cabbage plants - protecting them from cabbage bugs & slugs. I even squished a few slugs with my bare hands to save those plants. This is how the Evil Squirrel behaves. He had better not show his face to me any time soon or his time on this earth will be short. 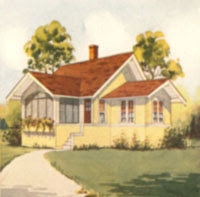 Received an interesting email today announcing a Twin Cities Bungalow Club event. They are sponsoring a talk Buying for the Bungalow: A Shopping Trip Through Time. The guest speaker is a historian for Rejuvention Lighting and House Parts. When I first bought my house, I spent hours looking through magazines trying to get ideas of how I wanted to decorate my house. When I bought my house, I didn't even know it was a bungalow. I only discovered this when I saw a house that looked a lot like mine on the cover of American Bungalow. When I found pictures I liked, I tore out the pages and put them into a folder. After a while I started to get a pretty good idea of how I wanted the house to look and what was appropriate for a bungalow, so I stopped saving magazine pages. I haven't looked in the folder since the day I stopped tearing out pages. Last week I was cleaning out some papers and I ran across the folder I had kept. I pulled out all of the magazine pages & looked through them. Some of them I looked at and thought..."what on earth was I thinking?" But there was one that made me stop and pause. I had to laugh. 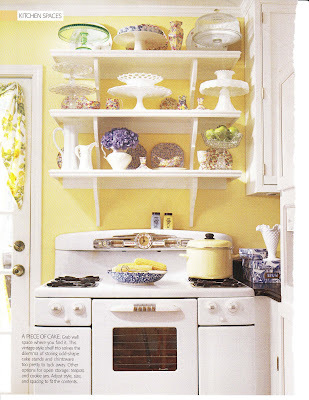 Recognize that stove? It's the exact Tappan Deluxe I have been restoring in my living room. Note the salt & pepper shakers on top. 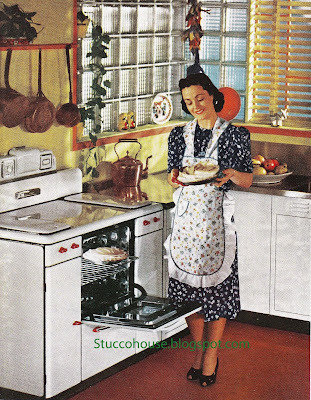 Somehow, I found this vintage stove picture to give me an idea of how it would look in my kitchen. Then years later the stars aligned (long after I had forgotten about it) to have that exact stove be the one I found on Craigslist for the right price at the right time. All I need is the speckled bowl & yellow stock pot. I'm in the middle of the thankless job of stripping all of the paint off of the scored plaster in my kitchen below the chair rail. Whose bright idea was it to do this? Oh, that's right. Mine. I have one wall completely done. I will admit that the scoring in the plaster looks much crisper now that 5 layers of paint have been removed. The scored plaster is very cool. One of those small details you only find in an old house. I think I'm going to paint this one wall the vintage red to see how it looks before I move on to stripping the paint off of the rest. Just to give me some hope & motivation. The plan: New chair rail to replace the mysteriously missing one. Wallpaper above the chair rail. Paint below. Oh, and I managed to fit three complete sets of dishes (Dansk, Sargadelos & Fire King) into my new cabinet.